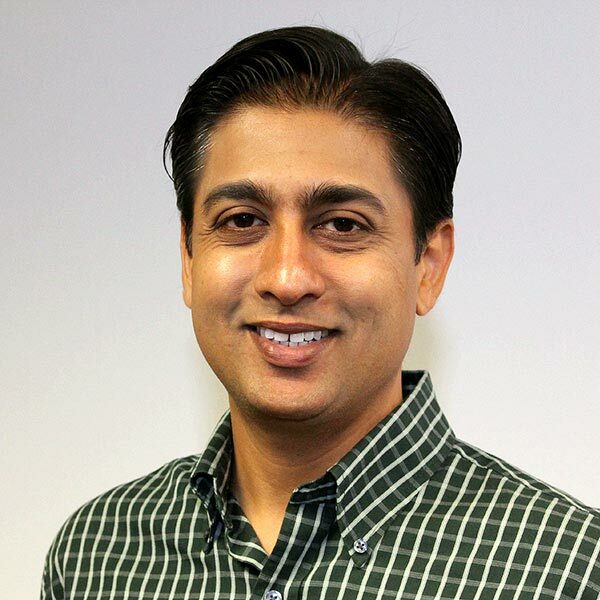 I'm sure you are aware of Microsoft's recent advances for Visual Studio, .NET Core, and their new efforts in creating/deploying/using web applications. Along with these accomplishments -- and also to give our ASP.NET team something else to do! -- we are releasing a set of seven native components to help you build rich browser-based UI using Razor Components and Blazor. Let's take a quick detour to understand what these technologies are, and how they could help you, and why we decided to create this new suite. 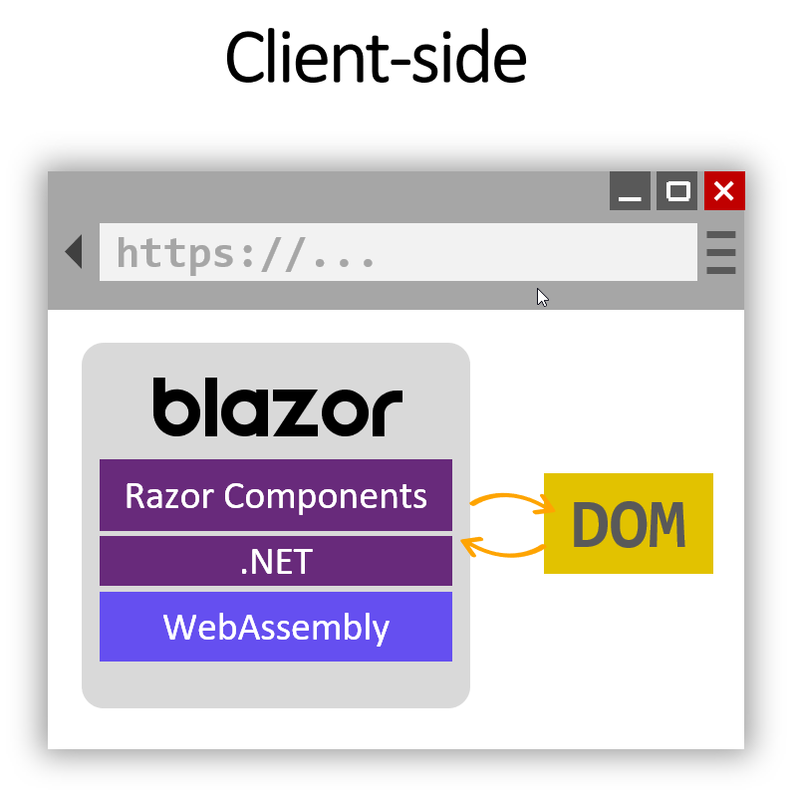 With Blazor / Razor Components you can now write rich interactive client-side web UI using .NET! This means you can write client-side web apps using C# and Razor syntax with .NET assemblies. In fact, the name comes from combining Browser + Razor = Blazor. Let's take a look at how Blazor works. What Microsoft did with Blazor is to run .NET code, using Mono compiled under WebAssembly, into Wasm code that could execute in the browser. What benefits does this give you? Blazor apps running on WebAssembly render client-side and you also have access to the .NET ecosystem. You can share the server-side and client-side logic. Full-stack development, in other words. Since it's all .NET, all the time, you can rely on its performance, reliability, and security. You're using Visual Studio 2019 for development. Currently, Microsoft describe it as "experimental". While Blazor on the client-side is still an experimental project, Microsoft has been shipping a steady stream of updates, so hopefully the experimental label will be gone soon. They're actively working to improve the downsides too and we look forward these updates. If you've used Angular or React, then you're familiar with the concept of everything in the UI being a component. Razor Components behave the same way. This component model gives you more control over how you build and control your UI. Razor Components are what you use to create Blazor apps. One key advantage of Razor Components is they can be used either on the client-side or server-side! However, Microsoft is actively updating Blazor on their GitHub repo and we look forward to see this new technology develops in the coming months. 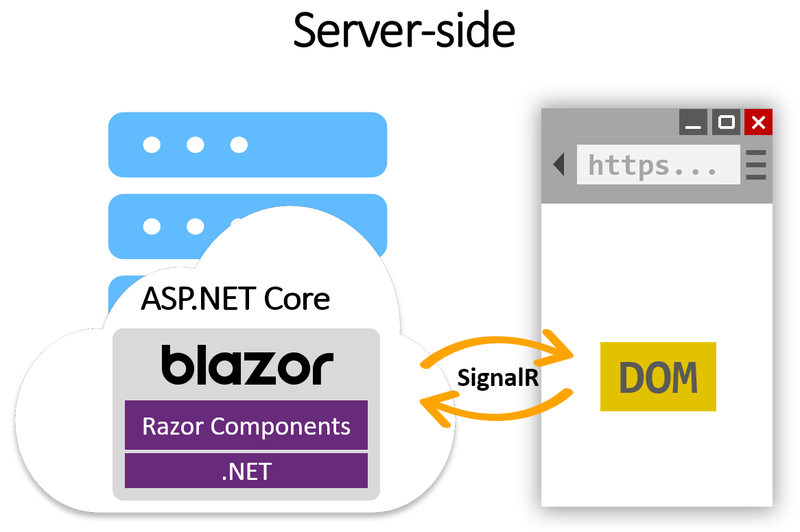 To celebrate this new technology, we have designed and created a new suite of Razor Components for Blazor. Best of all, these new components will work for both client and server side Blazor! The controls are native for Blazor and newly created by our ASP.NET developers. The same devs who have built our excellent ASP.NET controls. We are releasing them as a free "early access" preview through Nuget. There are seven components so far: a Grid (of course! ), a Pivot Grid, and various editors (a Combo Box, a Spin Edit, a Date Edit, Text Box, and Pager) that can be used within the grid. The grid is the most complete: it provides data binding, editing, paging, filtering, row selection, some pre-defined column types, and the use of templates. In fact, the data binding supports component parameters, which bind a property values across components. Obviously we have plans for more components and more functionality, and I'll talk about this in a moment. This preview is made available under the DevExpress Preview end-user license. 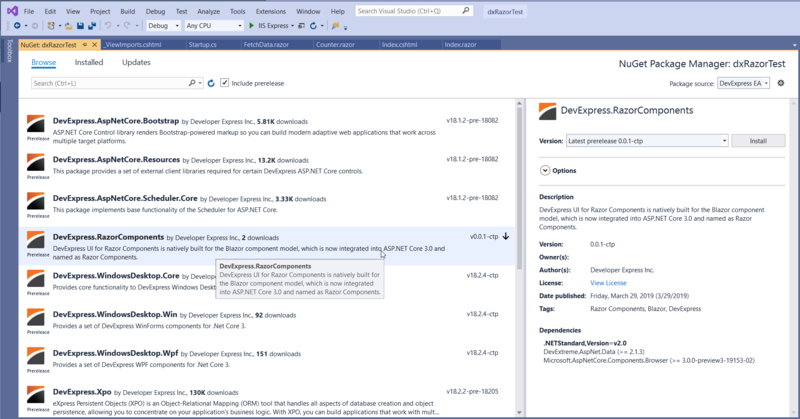 To gain access to the build free of charge, you will need a DevExpress.com account. You can either create a free account to test our NuGet package or you can get a free 30-day trial of all our controls. First, these preview components will be further developed with new features and functionality. Obviously, as Microsoft releases updates to .NET Core, so shall we. Second, although we have many plans for more components within this new ecosystem, as with all of our future projects we rely on feedback from you, our customers, on what we should be looking at and considering. Send us emails, open up support tickets, let us know. It looks like an April Fool's joke. Completely unexpected announcement, you said that you are just looking closely. 1) Is Blazor ready to use in production? 2) Are you really going to regularly develop your own set of components? 3) Which line of components do you plan to release? 5) In which version can we expect the first option - 19.1 or 19.2? 6) Why, then, did you decide to do XAF SPA at React, rather than using Blazor? 1) You'll have to direct this question to Microsoft. 2) That's our plan but the marketplace will ultimately decide. 4) Right now it's free. If we ever sell a bundle, it will be included it in our ASP.NET Subscription. 5) This depends on Microsoft. 6) At the time, Blazor was but a glimmer in our eye. Or maybe it's not too late about XAF SPA? Discuss with Denis, because the SPA has not yet been released to sail. Suddenly Blazor is a silver bullet. Yes, in DevExtreme there is a stable set of components, but at first XAF SPA doesn't need much IMHO. 1) Should we expect more new components for the Blazor in the near future? 4) The demo is loaded instantly, no brakes .. Is it really going to be everywhere? Everything that I tried before caused suffering and pain. As for the Free Blazor Training Course, I will express the opinion of a Russian person - it is hard to listen, read the text as if a robot. Video is preferable for reviews IMHO. Text articles would be much better. It looks like a port of bootstrap components and looks ugly. We expect to have something rich and powerful like DevExtreme for Blazor platform. What about SEO support (I don't have seen any statement to SEO yet)? What about responsive design ans mobile support? Can CSS and bootstrap still be used oder not? @Cory thanks! Test out the preview and give us your feedback too please. @Freddy, For this preview version, we'll collect information about what features are important to our customers. Thanks for you feedback, we'll make sure to include it in our plans. As for CSS, yes, you can still customize our Razor Components. Responsive design, Bootstrap, SEO, these are possible and I'll likely address how to do this in a future blog post and/or webinar so be sure to keep an eye on our newsletters please. 1. Yes we have plans for more razor components. 3. Thanks for your feedback. 4. Can you explain a bit more about the pains please? Email me at mharry@devexpress.com, thanks. Regarding videos text, I'll discuss it with our video team. However, I recommend you take a look at the http://blazor.net website and their docs. They are good for text based learning. I agree with Customer37575, some derivative of the Layout Control would be a great help. Do you know if these controls will be included in the ASP.NET subscription or will they be a separate package? And how will this affect the Universal Subscribers? If it's too early to tell, I'll understand. @Stephen thanks, we'll appreciate your feedback and will count your vote for layout control (@Customer37575). @Anders, Besides .NET and C#, why compare Blazor to WebForms (genuinely curious)? @Grame, thanks! Test out the preview and give us your feedback too please. endless scrolling on 1M+ page without COUNT()? Super fantastic , very excited ! It’s great surprise and news. Early access demos looks amazing, specially grid with 1GB database connected via EF 3.0. I can’t wait to grab solution form github and get into details. @Mehul Harry please send congratulations to team. And I hope Microsoft soon will move Blazor into Beta stage and “experimental” phrase will be removed. This is intriguing, certainly. This morning I have to go change the flowers at Silverlight's grave. Then I'll stop by the nursing home to check in on WPF. But when I get back I'll look into Blazor. Ok, seriously, this is interesting technology, but I wish we had a crystal ball to see what where Microsoft will be on this in 10 years. I'm not worried about DevExpress, you guys are great about supporting your products. Microsoft is a different story. The hamburger menu may needs a little work, but you all should not that the demo is reactive, the screens crisp and they come up fast. It a second or two for Pivot Grid Large Data Source page. I hope the grid become as nice DevExpress other offerings. Ignorance is bliss, but how you debug this? This is really amazing! Thanks for this great announcement! We already moved first small parts of our application to a Client-Blazor-SPA which does business communication and data reading via SignalR. We are looking toward the development of your components. The grid is a must have component for us. Looking forward to build a informational web interface SPA by using your components. Just came across this [great] news that DevEx has formally committed to Blazor/Rzaor components; My feelings are, Blazor is the next generation of ASP.Net (replacing MVC) with two flavors, server side and client side. So, betting business on Blazor at this point seems valid and a great timing to set DevEx is one of the primary component supplier for Blazor. a) Are you components build based on BootStrap 4.x or a propriety framework? b) If based on BS, do your component depend on jQuery? c) Are your components "Mobile" ready out of the box? As almost most SPA apps, are starting off being run on the Mobile screen size? d) Ability to turn our app to PWA, is this something under the control of Microsoft or Developer Express? e) For v1, what [business/data] related components are planned? i.e. A simple way to create a data entry form with Validation. Yes, we use Bootstrap 4.x + our additional css. The components do not depend on jQuery. c) Are your components "Mobile" ready out of the box? Based on Bootstrap, the components are responsive. The components will do their best to adapt to the screen size. We ship native Blazor components. If a web application can be turned to PWA, our components neither help nor prevent you from doing so. Please refer to the first two comments here. @Ray Navasarkian has already answered this question. Thank you Serge for the reply. I'm really excited with your Razor Components development. Are you planning on posting a roadmap in the near future? I'd like to see a comprehensive Blazor library at some point so that I can start migrating some of our WebForms applications. In my scenario, I have an immediate need for the following components. 1. 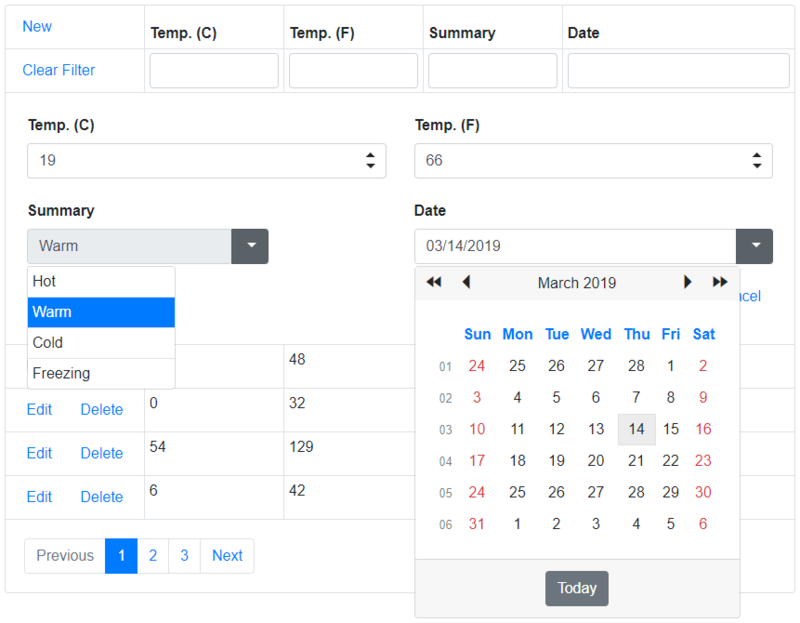 Hierarchical (master-detail) grid with basic column sorting, paging and the equivalent of ASPxGridView.SettingsSearchPanel (our users find this function very useful). I think you should strongly consider implementing some sort of layout mechanism that would allow dynamic resizing of child components (e.g. if I set the width and height of the grid component to 100% and the parent container is resized, the grid would automatically adjust to fill in the content of the parent). What about various themes? Honestly I'm not too impressed with the current option. Thank you, this is great new and keep up the good work! Today, I was testing the "Blazor" model of this new MSFT technology and watching the network and how much stuff has to get downloaded from server to client to start the Mono VM to run in another VM (WASM). To exasperate the test, I turned off WiFi on Mobile, and it took over 1 minute for a basic demo to load. And it's all have to do with all the Mono dlls that have to load up. There is no way an average Joe is going to wait over a minute for my app to load. Heck I will never even get him as a customer with that time. Unless MSFT does a total magic, "Blazor" will never fly. You can build a powerful Angular/React/Vue that loads up in split second, especially using lazy loading and use worker service to get data in the background. Having said that, my question is, is the "Razor Components" model a viable alternative framework to build a real Business App for desktop & Mobile than "Blazor"? I do like the fact many of my business logic is running on the server, close to the metal and I don't have to send load of JSON to client and then run lots client's code. Codes run on the server, user gets to see a reflection of data via SignalR. Sounds like a better alternative than Blazor. Do you (DX and it's customers) feel this is a more solid way to follow or should I go back to building the traditional REST Service and build my client using a proven technology like Vue? Note: I'm leaning towards Razor Components for the amount of Dev time I save. I'd love to hear your feedback, as this was intended to shed light for all of us. @Daniel, thanks for your feedback. We don't have an official roadmap yet but as you know, we're committed to Blazor and we'll see how it develops as a technology which Microsoft matures and how the web developers come to adopt it with other alternatives. @Ben, I spoke with Dan Roth, Microsoft PM for Blazor, about this and they've got some ideas around how to improve this scenario. As you know, there is nothing we can do on our side other than make our assemblies light and fast (they're pretty much are). As for adoption by web devs, this involves a crystal ball so I'll leave it alone. The technology is still new and they've some hurdles to overcome before many 'enterprises' will consider Blazor. However, it is an exciting technology for .NET web devs. For guidance on technology, I recommend using a proven technology which has several DevExpress controls available for it. ;-) But seriously, I'd recommend considering using the DevExtreme MVC controls for ASP.NET Core. Or our controls for React/Vue/Angular. It depends on your needs. Currently, we have *seven controls* in *preview* for Blazor. This will change in the coming months. So my advice in the future will likely change as well. Does this help? But the core of my question was something else. The question was, Blazor (client side) needs a total re-write of the Mono without using a Mono style VM. WASM is already a VM, so our app has to run inside TWO VMs. That's the first problem. Second problem is the sheer # of .Net dlls that has to be loaded. That's not gonna fly. Knowing this major hurdle, my question is, is the Server side (Razor Component) model a better way to build an app as it is just like MVC server side without the need of all that HTML, JS, data to travel to client in case of MVC. The network traffic is much lower with Razor than MVC. And MSFT has indirectly said it, that Razor Components are the next generation of ASP MVC server side. Just be clear, do you guys (DX & customers) find it that Razor Components is a better way than the old style server side code generation? (just look at each MVC page, how big it is for Mobile). Hope I'm more clear now. Is there a chance to somehow wrap devextreme components into blazor components? I would not mind writing my own wrapper components. @Dalibor, I'll write another post about how we built our new Blazor components. However, they do not wrap DevExtreme.